Only in the world of collecting could something be considered “Good” but not actually look as good as the more non-specific qualifier “Fine.” But if you’re going to collect comic books, you need to know your grading terminology or live to regret your ignorance. A few months ago, I said I’ve made a few purchases that I’ve come to regret during my many years of collecting – fortunately nothing too big or significant dollars and cents-wise – but still, if I could go back in time, I would stop myself from buying these issues. Amazing Spider-Man #313 is one of those issues, not because it’s a particularly expensive issue, and not because I spent that much on it, but because it’s a haunting reminder of a time when I thought of myself as a legitimate collector, but I didn’t know the ins-and-outs and terminology of the industry. In this case, I needed to know my grading. I picked up ASM #313 during a weird in-between time for my collection. I was a few years past the period when I first started buying Silver Age issues as a teenager, but I also hadn’t yet received the “big box of comics” of ASM’s in the 200s, 300s and 400s that would essentially resuscitate my collection and put me well on my way to eventually owning every issue of ASM. 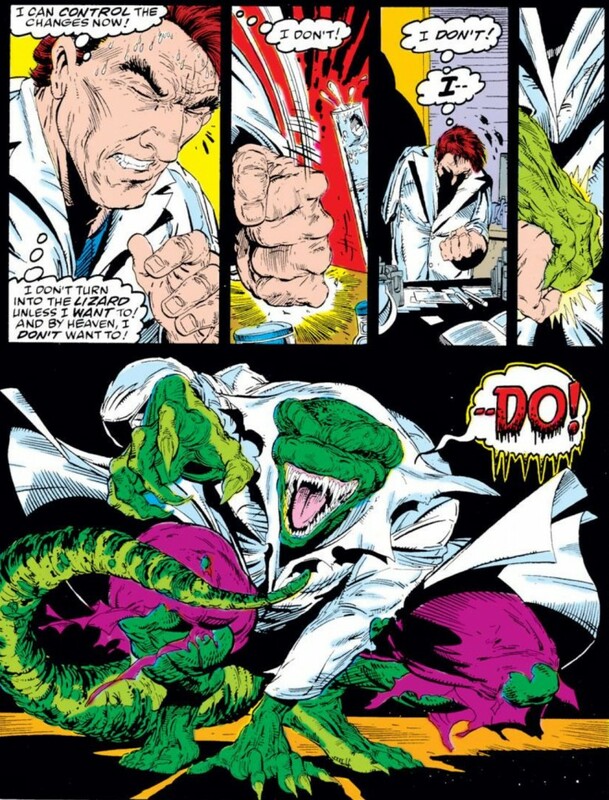 I was trolling eBay and saw a couple of auctions of Todd McFarlane-era issues, and since I still had (still do today) an attachment to these issues because they were first released when I was a little kid, I submitted some bids and shockingly won the comics with very little competition or drama. That was red flag number one, but I didn’t quite understand why in the moment. One of the first things I did when I started Chasing Amazing, was create a page dedicated to the comic book grading scale because I know I’ll occasionally throw the terms around like Near Mint, Very Fine, etc. and since I know that just as many non-collectors will read this site as collectors, I wanted them to have at least some sense of what I was talking about. But maybe I also posted that page because ASM #313 is constantly on my mind. Hey, just like Peter Parker, I needed to learn from my mistakes. Don’t get me wrong, I wasn’t completely oblivious to the idea of a collector grading system. When I used to buy baseball cards, I remember looking up the price in a Beckett nagazine and I’d see a “Near Mint” listing, and then a lower price for a card that had sustained a little more wear and tear. I always loved to pretend I owned a card that was worth the full Near Mint value, but even as a little kid, I knew better. My cards were not in Near Mint condition. So, when I was scouring different auctions on eBay that day, I noticed that some sellers were using a wide range of grading terms – good, very good, fine, very fine, and more. When I stumbled on the McFarlane issues auction, the description said the comics were in “good and very good” condition. Since, my interpretation of the word good means “good” – as in desirable, or at the bare minimum, nice to look at – I figured that this was an auction worth pursuing. I didn’t even examine the scans provided, because hey, the seller said they were “good” or “very good” and it’s not like these comics were released in the 1960s or 70s and were thereby subjected to a lot of wear and tear. These comics came out about 10 years ago – I never remembered seeing any issues from that era that were too beat up. And that’s how stupid, misinformed purchases are made! I was stunned to win the auction without at least one other bidder swooping in and driving up the price, but that’s because who in their right mind is going to buy a run of issues in a low-grade quality that are only worth a few bucks a piece in Near Mint condition? When I opened my package, I was absolutely horrified. 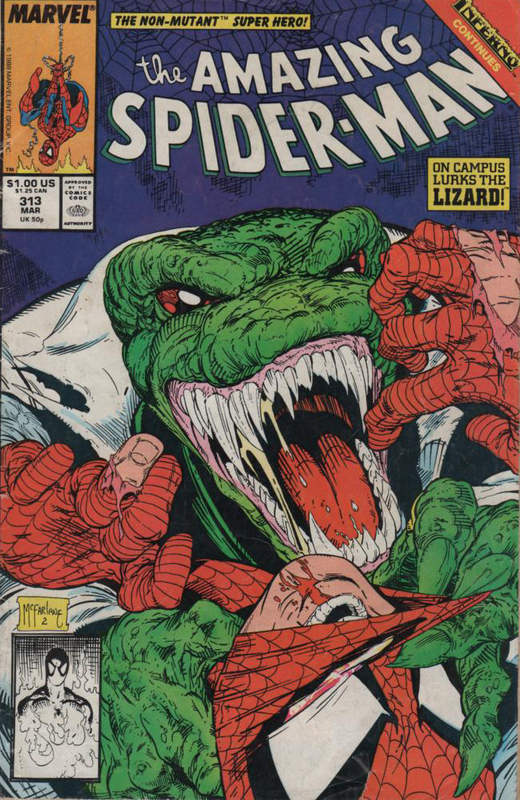 While all of the issues I received from this seller were in similar condition, ASM #313 stands out to me because I remember that cover when I was younger – the Lizard, looking more like a dinosaur, with his teeth gnashing and claws attacking Spider-Man. It was terrifying and fun all in one package. Instead, the issue I got had a wrinkled cover that looked like somebody was sitting on it for a few hours. There was a price sticker on the back of actual comics! Did the guy who own this before me never hear of a bag and board? I was so ticked off, I was ready to go on eBay and leave bad feedback. How could somebody sell me comic books that looked like this? Before I did anything, I double-checked the item description and saw “Good” and “Very Good” again. 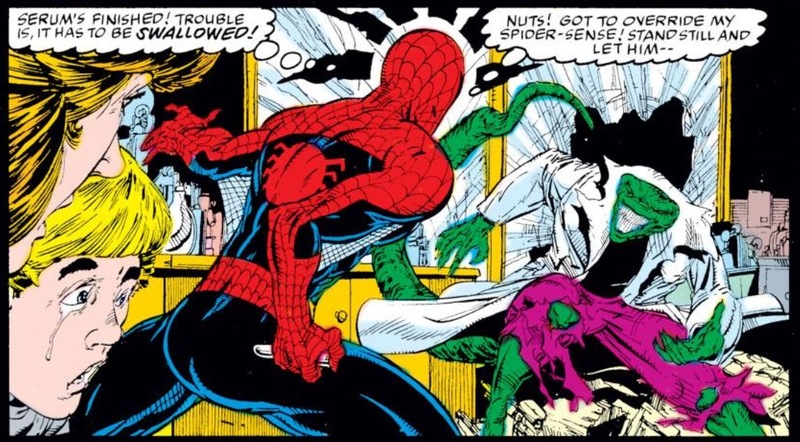 But fortunately, before I caused myself any more embarrassment, I Googled comic grading terminology and discovered that I purchased exactly what was described – an issue of ASM #313 (and others) in Good or Very Good condition (more Good than Very Good). I just had no idea that “Good” meant lots of wrinkles, tears, stickers, writing, etc. This issue, and the others I got that day, are easily replaceable. You can find copies of the McFarlane run everywhere and at a very reasonable price. I could probably even find some copies in $1 bins at comic book shows. In other words, one day, I’ll get myself some nicer copies. But for the time-being ASM #313 is a reminder of my carelessness. When I was in school, one of my greatest flaws as a math student was I was too lazy to go back over and check my work. I would lose points on a test not because I didn’t know how to solve the problem, but because I didn’t take my time. Here, that trait embodied itself in this comic book. 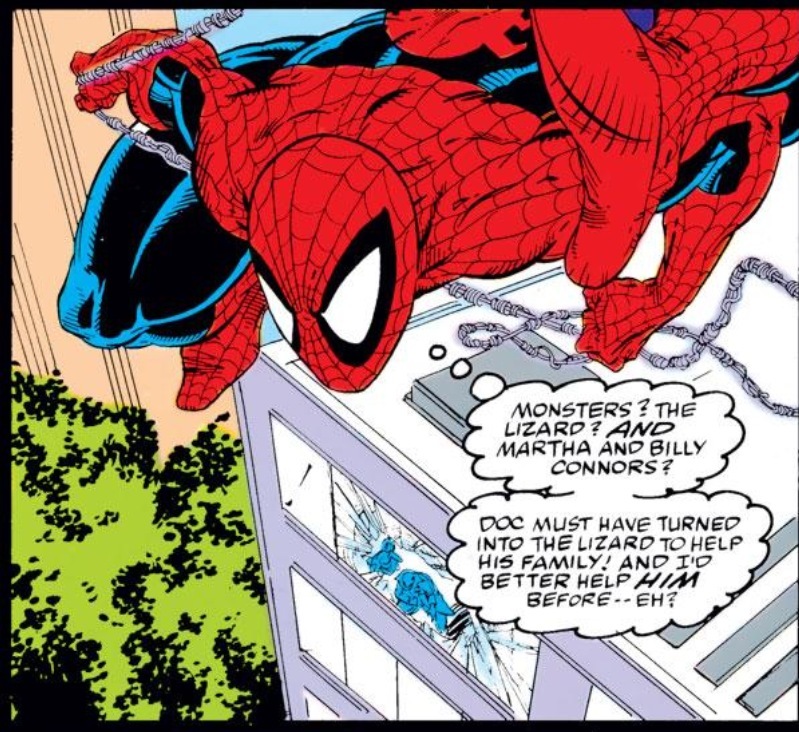 After ASM #313, never again did I buy a comic book without knowing what condition it was in, and what the terminology used to describe that condition actually meant.